I’m very into versatile shredded meats lately. That’s probably a weird statement, but I live by myself so I’m constantly eating leftovers, and it’s so nice to make a batch of something and then be able to use it creatively in new ways for a few days. When I was on my family vacation in North Carolina last week my cousin Dan made this recipe and served it for tacos and I absolutely loved it. 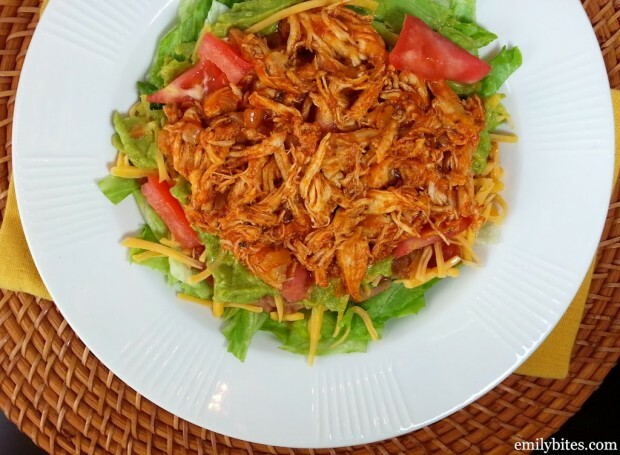 The chicken is juicy and flavorful and can be used in endless ways: to top a salad (pictured below), in taco shells, in a burrito bowl, in lettuce wraps, on a Mexican pizza, etc. My favorite way to eat this is actually straight-up (pictured above) because it’s full of flavor on its own. Add a few sides and you’re good to go. 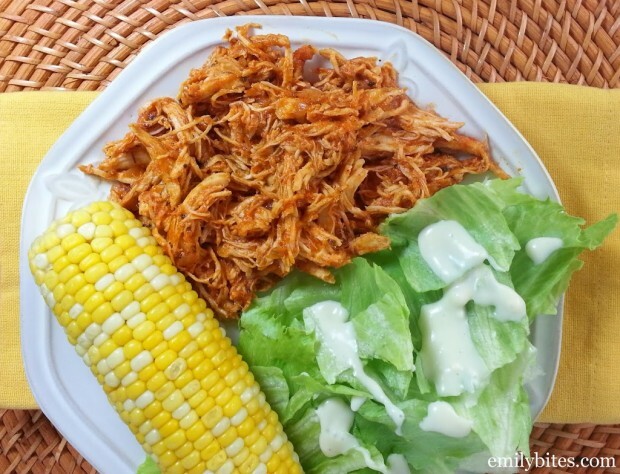 For other versatile shredded meats (still a weird statement, but I’m rolling with it), see: Slow Cooked Mexican Pulled Pork Tacos, Slow Cooker Buffalo Chicken, or Slow Cooked Barbecue Beef. In a medium bowl, mix together the tomato sauce, vinegar, garlic, chili powder, cumin, oregano, sugar, salt and pepper until thoroughly combined. In a large skillet or sauté pan, bring the oil to medium-high heat. Add the chopped onions and cook for a couple minutes until they start to soften and become fragrant. Add the chicken breasts in a single layer and cook for 3 minutes on one side, flip them over, and then continue to cook for 3 minutes on the other side. Add the tomato sauce mixture to the pan and bring it to a boil. Lower the heat to medium-low and cover the pan. Simmer for about 20 minutes until the chicken is fully cooked through. Remove the lid from the pan and transfer each breast to a cutting board, shredding it using two forks and then returning it to the sauce. When all the breasts are shredded, stir them into the sauce until thoroughly combined. Continue to cook for about 5 more minutes until the sauce thickens and soaks into the chicken. I have waited all day for this recipe. I saw your teaser on Facebook last night. This will be on next week’s menu for sure. I will post a review then, but I already know it will be a hit. All of your recipes are, Emily! Thanks for all you do! i am beyond excited to try this one! 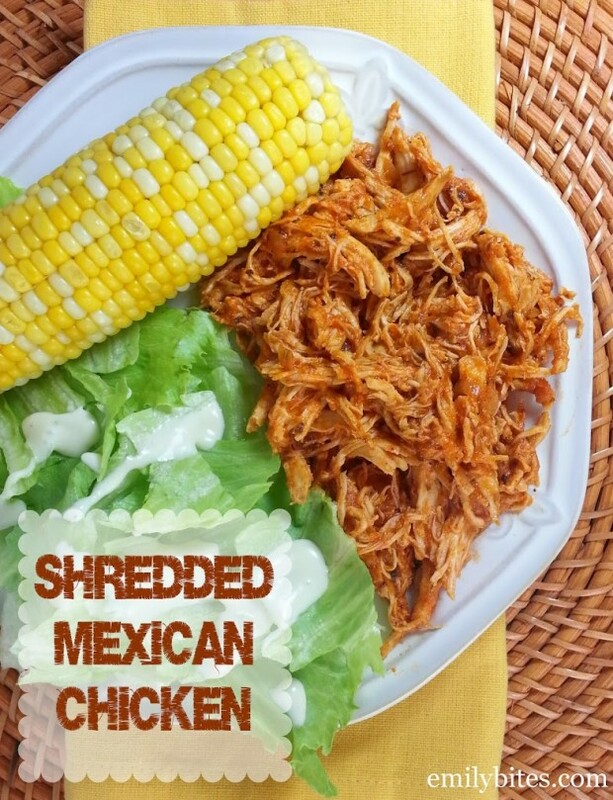 i love that this shredded chicken recipe doesn’t require cooking hours in the crock pot. thank you! Ok, I made this tonight and it was delicious! My son even told me that I made a great supper! I never hear that. I served it straight up, along with a big garden salad and fresh sweet corn. Your picture inspired me. This one is a keeper. Thanks, Emily. Kristine, I forgot to say that I made it in the crock pot. I just threw everything in cold and it turned out great. I love the salad. I think adding the corn would be a nice touch too. Can this be made in a crockpot? I love recipes i can juat throw into crockpot since i dont have time to be in front of a stove…. This was delish! I made it in the CrockPot–I put the chicken breasts in first. Then I stirred together the first 8 ingredients (I omitted the oil and onions), and poured that over the top of the chicken. Obviously all CrockPots are different, but I cooked it on low for 8 hours and it turned out perfect. I added a small can of mild green chilies for a tad bit more heat. It was a hit! This looks so delicious! I am so glad people posted that they made it in the crock pot, because that is how I want to make it. Thanks, all! Thanks for this recipe! I did not make mine in the crock because I find that my chicken breasts, even when completely submerged, dry out. So I did it stove top! I mixed up my “sauce” the night before to make it that much easier. This is a fantastic, easy, yummy dish. I was able to pull it together while home alone with a 5 month old and 2 year old. 🙂 I served mine over a bed of spinach. I heated up some canned salt free corn and canned low sodium black beans on the stove, and spooned in some of the sauce from the chicken. I also added some feta cheese. You don’t need to add dressing, the sauce already moistens it up! It was delicious! PS: I now use the seasonings you suggested be added to the tomato sauce as my go-to taco seasoning. SO GOOD! Made this tonight and it was SO good! I made “chips” out of lavash bread and topped it with the chicken and a little shredded cheese. Tomorrow I’m going to have the leftovers in a salad. Hi Emily, I’m from Australia and I need clarification on your ‘can of tomato sauce’. We have canned diced tomatoes but are you meaning to use tomato sauce like what you have on a hotdog? Nope 🙂 it’s like pureed tomatoes. You could use diced tomatoes and blend then I’m sure! This was fantastic!! Loved it. This was incredibly delicious – the flavors were more nuanced than I expected, and it had the perfect kick. The chicken was very tender and moist. I omitted the oregano and added fresh cilantro when the chicken was done cooking to make it more “Mexican” (what I think of as Mexican anyway). I also added a little crushed red pepper to the sauce because we like our food spicy. I served the chicken over lettuce with a little ranch dressing, fresh grilled corn with diced jalapeños, black beans, fresh tomatos, and avocado. It made one of the best salads I’ve ever had. I’d also serve this chicken over rice. Thanks so much for the recipe, you are awesome! This looks amazing and in process of making it tonight. Only thing, I just entered it on WW Recipe Builder so I would have it readily available in the future and it came up with 5 WWP+. Not sure if there was a change in their program but it still is great points for such a delish dish:) Thank you. Sorry I probably being stupid does the t stand for tabe spoon or teaspoon ? I just made this for my boyfriend and I for a New Years dinner and it was amaze! I used cayenne pepper instead of chilli powder and added smoked paprika too! Thank you! Great result! Yum, sounds great! I’m glad you both loved it! Was running low on ingredient, because we couldn’t make it to the grocery store until after dinner and stumbled upon this recipe. Made a slightly altered version (with what ingredients I had-no white wine vinegar or tomato paste, and I used some cajun and taco seasoning because I was running low on chili powder). I served over Mexican rice with a side of re-fried beans. It was excellent! Thanks for the recipe! “2 t white wine vinegar”. Teaspoon or tablespoon? “1 T extra virgin olive oil”. Teaspoon or tablespoon? Would be nice if teaspoon and tablespoon was more clearly differentiated by more than capital letters. I want to try it next time with more chili powder& cumin and maybe try blooming the spices in the oil instead of the tomatoe sauce. I am SO impressed by this recipe, thank you and thanks for entering it into myfitnesspal! I put these on toasted corn tortillas with cilantro, chopped onion, queso fresco, sliver of avocado and a squeeze of lime. JUST PERFECT~ This is the first recipe I’ve come across of yours and look forward to trying your others. Made this for dinner tonight and it turned out absolutely amazing. We made it with a quinoa burrito bowl dish. We will be making it again. Thank you! Hi! I was wondering if I could use tomato paste instead of tomato sauce? I made this chicken for dinner, and it tasted too italian. Does anyone else taste what I’m tasting? Maybe it’s the oregano? Okay guys, as someone who comes from the culinary industry, t and T are the STANDARD abbreviations for teaspoon and tablespoon. I’m sick of seeing y’all take Emily to task over this in the comments. Is this chicken spicy? I’m not a fan of spice so I’m wondering if I should cut down on the amount of chili powder and cumin. I wouldn’t say it’s spicy, I think you’ll be okay! Do you know how this could be made in an Instant Pot? Thanks. It looks delicious. I had a recipe like this, but lost it. I’m not a natural in the kitchen, so throwing spices in and testing combinations is not my thing. I stumbled upon this through a search and I cannot tell you how grateful I am to have found it. Problem solved!! I make a big batch and then freeze my portions. I pull out a portion the morning I’m going to eat it for dinner. Serve it up on street taco tortillas with shredded red cabbage. YUM!! !